Next Wednesday, an anthology that I have a story in will be available for purchase. This particular anthology is very dear to my heart, and I am very proud to be one of the authors to have a story ("Tradition") in it. When I first heard about the oil spill, I felt horrible for the people in the Gulf. It seems like they've had nothing but bad luck in the past few years from hurricanes to this environmental disaster. 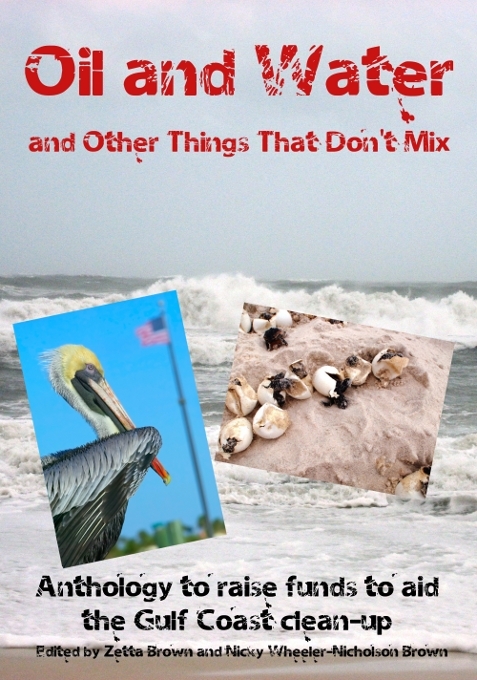 The best thing about the Oil and Water...and Other Things That don't Mix anthology is all the proceeds go to raise funds for the Gulf Coast clean-up. Here is the media release for the anthology. During the season of giving, consider buying a copy for yourself or a family member or friend. For one, you get a great anthology. For two, you are giving a charitable donation to help others in need. The BP oil spill disaster in April 2010 prompted authors Zetta Brown and Nicky Wheeler-Nicholson Brown from the She Writes™ online community of writers to develop the charity anthology Oil and Water...and Other Things That Don’t Mix. All proceeds will be divided between charities that not only help the wildlife and environment, but also the people living in the area. With this in mind, they picked the charities of The Bay Area Food Bank (www.bayareafoodbank.org) and MOBILE Baykeeper® (www.mobilebaykeeper.org) to aid their continuing mission to help the Gulf Coast communities affected. After placing a call for submissions last June, the resulting anthology features award-winning authors, poets, journalists, bloggists, newly published authors, and talented new authors making their debut. The women and men contributing to the anthology came from everywhere wanting to do something to help the Gulf region. The official theme of the anthology is “Conflict...Resolution optional.” Not all stories are specific to the South, but all have the theme of conflict and there is fiction and non-fiction inside. The stories, poems and recollections will make you laugh, cry, think—and some may even get you angry—and topics range from personal relationships to dealing with the kitchen oven. The editors of Oil and Water...and Other Things That Don’t Mix are from the South. Zetta Brown is from Texas but currently lives in Scotland with her husband Jim Brown, and together they own and operate LL-Publications that will publish the anthology. Nicky Wheeler-Nicholson Brown was born and raised on the Gulf Coast of Alabama. She is currently an editor and ghostwriter for several publishing houses in New York and the Berkshires and is following in the footsteps of her grandfather Major Malcolm Wheeler-Nicholson, founder of DC Comics. Oil and Water...and Other Things That Don’t Mix is scheduled for release on December 15, 2010 and will be available from www.amazon.com, www.barnesandnoble.com, direct from the publisher at www.ll-publications.com, and from many other online book retailers. Other retailers who wish to carry the book should contact Jim Brown at editor(at)ll-publications.com for details. LL-Publications (www.ll-publications.com) is an independent publisher based in Scotland specializing in genre and literary titles in both print and ebook formats since 2008. Congrats for getting itno such a wonderful anthology! I'm going to get one! I just ordered my copy and paid through payal. It was very easy! Neat! Congrats! Can't wait to read it.